A village variety show was held in the Lyon Hall Hodnet in aid of the Scouts and Guides Building Fund. 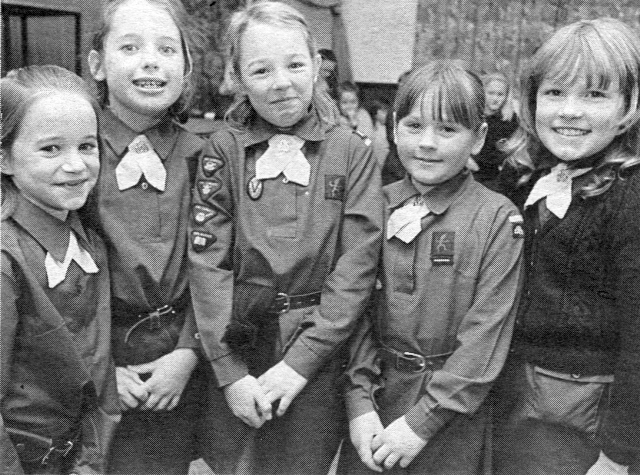 1-Members of Hodnet Guides and their leaders. 2-Alexandra Moruzzi, Jane Preston, Claire Critchley, Tracey Ann Talbot, Sian Knight. 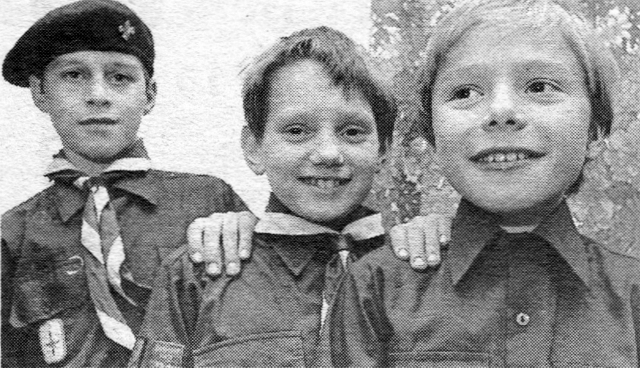 3-Orwin Bozier, Richard Talbot, Julian Morgan. 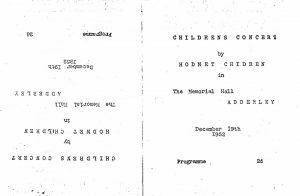 Members of the Hodnet Brit­ish Legion, Women’s, Section entertained about 60 children from the village to a party at the Lyon Hall. 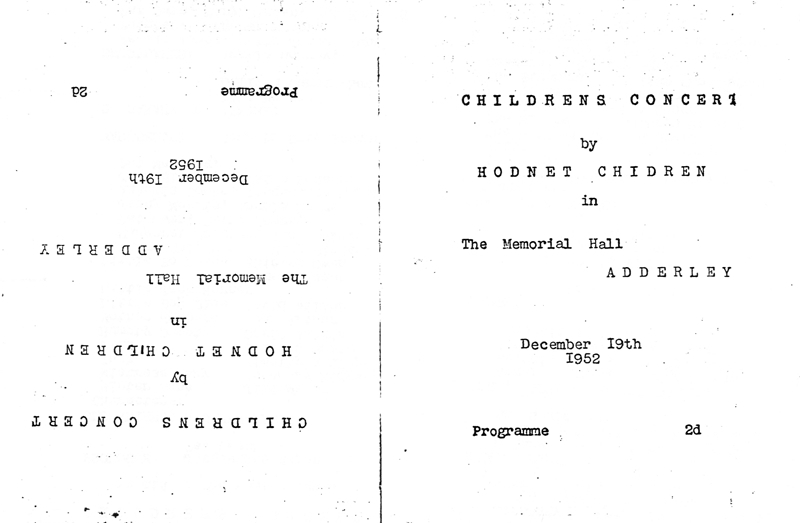 After an excellent tea provided by the lady mem­bers and crackers supplied by Mr. Dare Powell (president of the men’s section) the children played games. Each child received a gift from the Christ­mas tree donated by the men’s section and these were presented by Mrs. D. Stanier, president of the ladies section. Hodnet Drama Group Presented Bernard Shaw’s comedy “Arms and the Man” on Saturday and Monday in the Lyon Hall, with the following cast: Raina, Janet Griffiths: Cather­ine, Stella Bowen; Louka, Jill Major; Bluntschli, Pat O’Dwyer; Russian officer, A1wyn Griffiths; Nicola, Clive Daly; Petkoff, James Hugill; Sergius, Alwyn Griffiths. 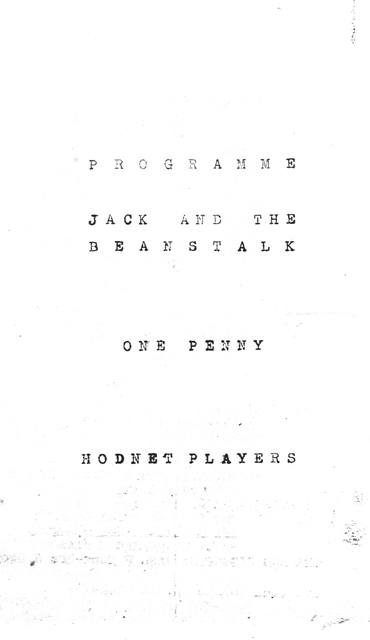 The play was produced by WiIf Major and James Hugill; the stage manager was Donald Packman; dressing of the parts by lrene Hugill; stage furniture was lent by Monty France, of Hodnet. 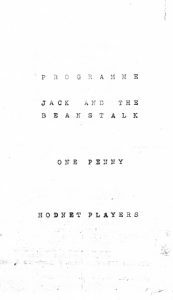 The Hodnet Drama, Group are to be congratulated on their choice of play, on the skilful production, and on the casting of the players, all of whom, on their showing, must either, have had considerable experience or intensive rehearsal. The play went from curtain up to curtain down with verve and pace which was a delight to watch. The persistence of Shaw’s popularity with amateur players is certainly understandable. The staging of the play was simple, but with the help of rather ingenious additions to space, lighting and proscenium decorations, effective. 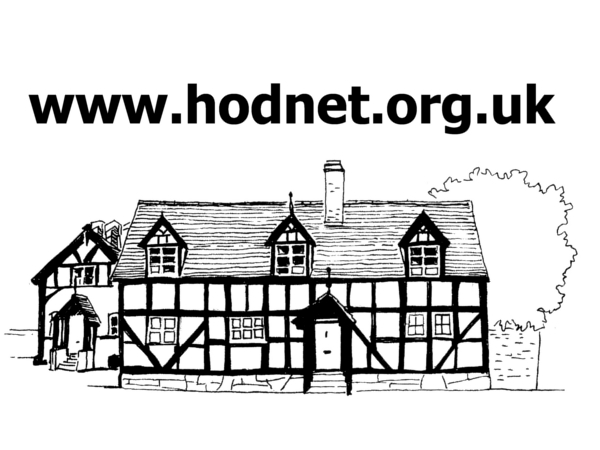 Hodnet are fortunate in having such a fine village hall and such a live drama group. Wilf Major and James Hugill. The Action of the Play takes place in 1885 in a small town near the Dragoman Pass in Bulgaria. Village Children: Mary Bladen, Margaret Preston, June Painter, Pat Owen, Betty James, Jenny Morris, Angela Morrey, Antonia. Cooke, Jacqueline Major, John Bladen, Gillian Dodson, Pat Manning. Rosemary Ridgway, Timothy Astley, David Watkins, John Bladen, David Wilson, Keith Wilson. Hilary Wynne, Cathryn Ridgway, Jill Major, Lillian Cunningham, Ann Gould, Ivy Rudd. Angela Morrey, Gillian Bowen, Antonia Cooke, Timothy Astley, Jenny Morris, Pamela James, Jacqueline Major. Reapers: Shirley Owen, Pat Leech, Margaret Harper, Rosemary Dodson, Jean Arthur, Pat Manning. HODNET Players presented the panto­mime ,’Jack and the ‘Beanstalk” in the Lyon Hall on Monday and Tuesday to large audiences. 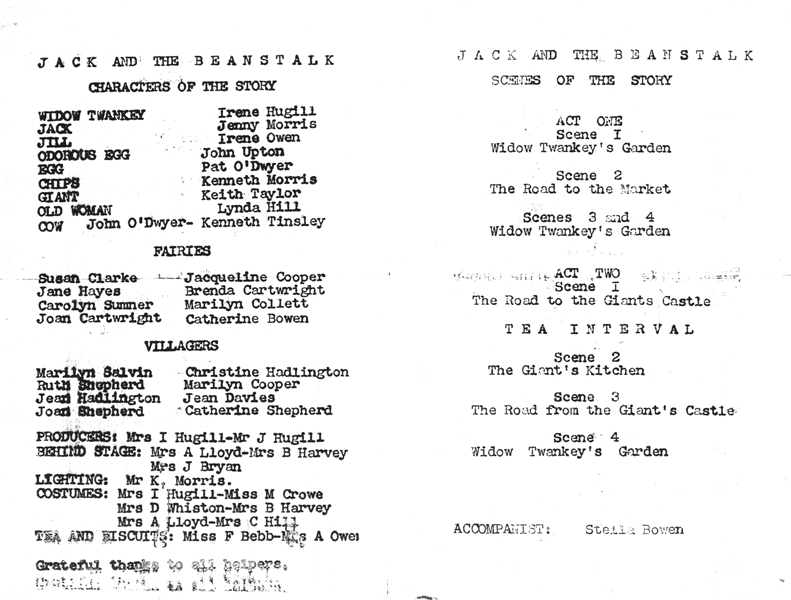 This was the first pantomime to be staged by the company. 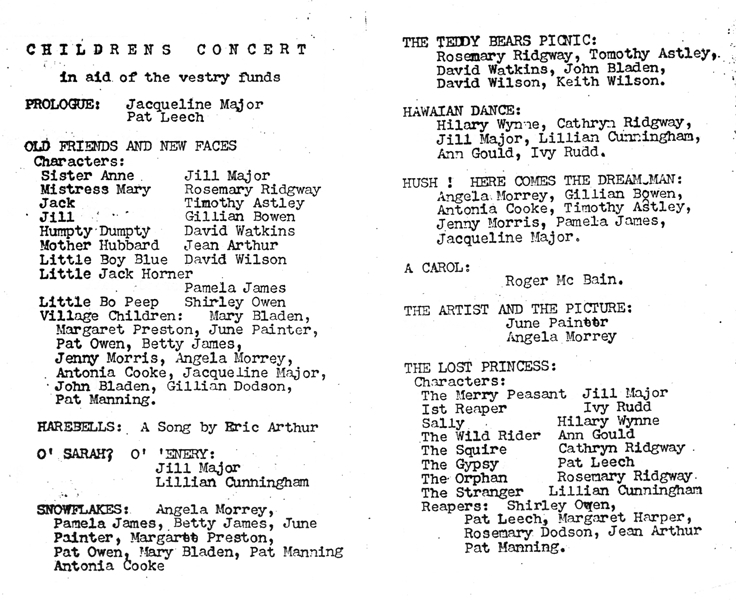 Taking part were: Widow Twankey, Irene Hugill; Jack, Jenny Morris; Jill, Irene Owen; Odorous Egg, John Upton; Egg, Pat O’Dwyer; Chips, Kenneth Morris; Giant; Keith Taylor; Old Woman, Lynda Hill; Cow, John O’Dwyer and Kenneth Tinsley; Fairies, Susan Clarke, Jacqueline Cooper, Jane Hayes; Brenda Cartwright, Carolyn Sumner, Marilyn Collett, Joan Cartwright, Catherine Bowen; Villagers, Marilyn Salvin, Christine Hadlington, Ruth Shepherd, Marilyn Cooper, Jean Hadlington, Jean Davies, Joan Shepherd, Catherine Shepherd.